Brodhead City Hall is located at 1111 West 2nd Avenue, Brodhead, WI 53520; phone: 608-897-4018. Photo: Francis West Smith House, ca. 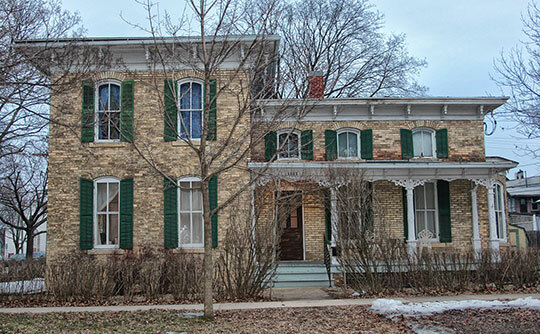 1877, 1002 West 2nd Avenue Brodhead, Wisconsin. Listed on the National Register of Historic Places in 1979. Photographed by User:Royalbroil (own work), 2014, [cc-by-3.0 (creativecommons.org/licenses/by/3.0)], via Wikimedia Commons, accessed September, 2017. Brodhead  was first incorporated, as a village, in 1880; it was re-incorporated, as a city, in 1891. It was founded in 1856 and named for Edward Brodhead who was the chief engineer for the Milwaukee and Minnesota Railroad. The Francis W. Smith house (photo) is an excellent, intact example of an Italianate house, constructed for a middle-class merchant in a small community settled by Yankees. Brodhead contains many fine Victorian commercial and residential buildings, most of which are constructed of cream brick. Of the brick residences, the Smith house is one of the best, both in the craftsmanship of the masonry and woodwork and in the preservation of its original fabric. City of Brodhead, Greene County, Comprehensive Plan, 2005, www.cityofbrodheadwi.us, accessed September, 2017.